Simply stunning! The elegant and classic styling of this Sinfona Lady Masquerade Mask - Bianca White makes a bold statement and is the perfect way to to hide your identity. 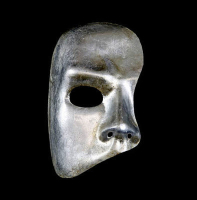 The ultimate in luxury the timeless design of this lovely mask will ensure that its style will never date. 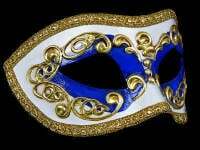 Decorated with a real sheet of music paper this is a white and gold painted colombina style mask finished with stucco and real gold leaf! The perfect combination of feminine style and glamour this Mask by Simply Masquerade gives a sweet sense of style a stunning fashionable edge. 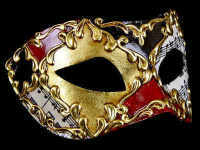 All Venetian masquerade masks are hand made and painted in Venice, Italy.